Size: 300 x 150 mm Approx. Water Tank Size: 600 x 400 x 400 mm Approx. 1. Determination of metacentric Height of a war ship. 2. Determination of metacentric Height of a cargo ship. This apparatus is used to determine he metacentric height of a ship model under load and unload condition. (flat bottomed vessel).This apparatus consists of : 8 A flat bottomed semi-circular ship model of size 250 x 200 x 200mm. Semi Circular Sectioned hollow ship model, provision for loading as Cargo and warship, fine arrangement for accurate angle measurement extra weight in Metric Unit for tilting coupled. 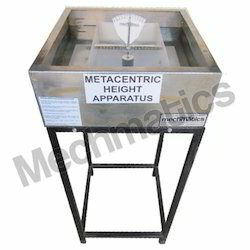 Metacentric Height Apparatus is available in several designs and sizes as per the demand of the patrons. These products are made using supreme class material in line with set industry norm. Moreover, prior to dispatch to the market, all products are checked under the supervision of quality controllers. Apparatus for Determination of Metacentric Height.